The Hindu faith, which is the third largest religion in the world, began around 500 BC, making it one of the oldest organized religions in existence. In the Hindu faith, there are many important gods and goddesses that are vivid characters in stories of love, valour, and pride. Even today, Hindu deities are revered by members of the faith, many of whom reside in India-where the religion was born. If you’re interested in learning more about the meanings behind these Hindu tattoo designs, read our list below! Ganesh: a popular idol in the Hindu religion, Ganesh is recognized by his elephant head, after Lord Ganesha, who symbolizes the overcoming of obstacles. Kali: a Hindu goddess, Kali, also known as the Terrible Mother, symbolizes creation, destruction, and power. 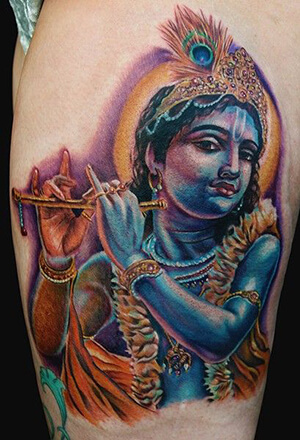 Krishna: known as the Supreme Being, Krishna is known for the feather he wears and the flute that he plays. Krishna is a Hindu god who represents the incarnation of wisdom and truth. 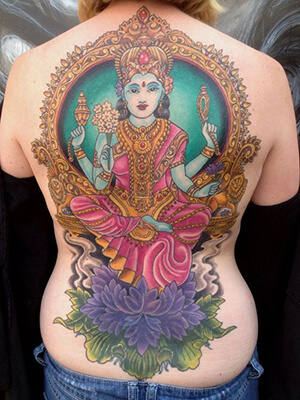 Lakshmi: this Hindu goddess is the wife of Lord Vishnu, and she symbolizes wealth and good fortune. Lord Vishnu: with pale blue skin and four arms, Lord Vishnu is a Hindu symbol of protection and security. 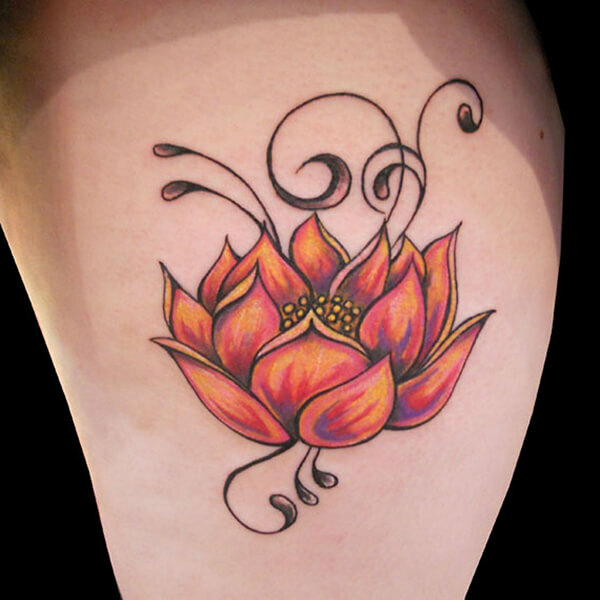 Lotus: this unique flower is considered sacred in the Hindu faith, and it is a powerful symbol for beauty, purity, and enlightenment. Interested in other flower tattoos? We’ve got you covered. Nandi: this creature is half-bull and half-man, and Lord Shiva uses Nandi as his mount. 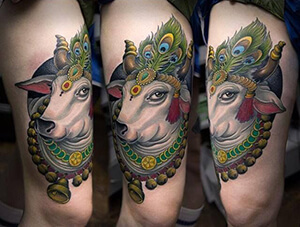 Nandi is a Hindu being that represents happiness, joy, and good fortune. 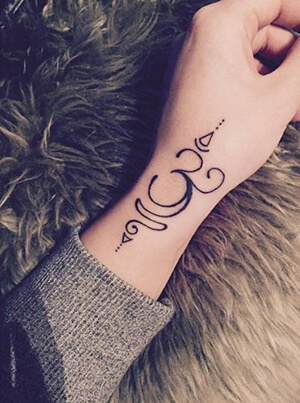 Om: a major symbol in Hinduism, the Om symbol is a mantra that calls upon Supreme Being. Chanting this three sound word is supposed to capture the essence of the entire universe. 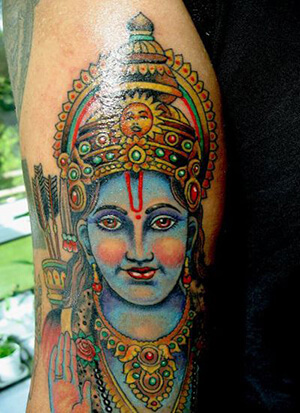 Rama: a blue-bodied god often shown with a bow and arrow, Rama has become a symbol of virtue and good governance, known for his compassion, bravery, and devotion to religious duties. 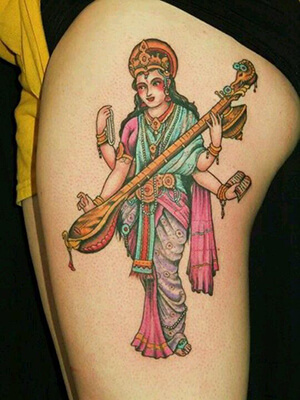 Saraswati: this tattoo design depicts a woman with four arms, who plays the veena. She’s typically shown seated atop a swan or a lotus, and she symbolizes passion for arts, learning, and music. 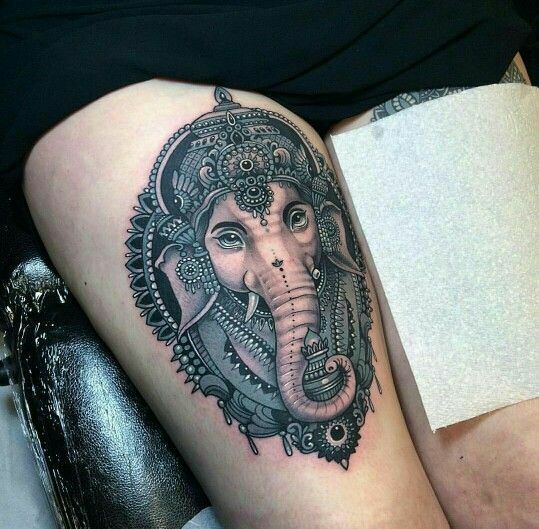 Hindu tattoo designs are often based in ancient stories about gods and goddesses with admirable virtues and powers. These deities feature aspects of humans, animals, and nature, and their visual symbols make very compelling tattoo designs. If you know of other significant Hindu tattoo designs and meanings, let us know about them in the comments section below!